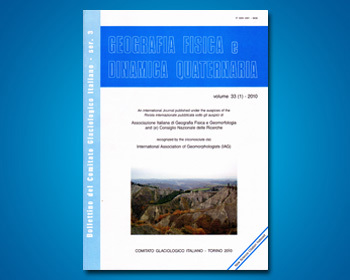 BARBIERI M. & MARCHETTI M., Morphometric analysis of the drainage network in the Modena and Reggio Emilia Apennines (Northern Italy), Pages 87-96. CICCACCI S., DEL MONTE M. & MARINI R., Erosion and recent morphological change in a sample area of the upper Orcia River Basin (Southern Tuscany, Italy), Pages 97-109. COMOLLI R., PREVITALI F. & SEFRNA L., Soil development along two altitudinal transects from north-west nto south-east of the Issyk-Kul Lake (Northern and Central Tjan-San, Kazakhstan-Kyrgyzstan), Pages 111-124. D’ALESSANDRO L., DE SISTI G., D’OREFICE M., PECCI M. & VENTURA R., Geomorphology of the summit area of the Gran Sasso d’Italia (Abruzzo, Italy), Pages 125-141. IETTO A., ALTOMARE C., DONATO F.F., FEDERICO M., IETTO F. & TETI F., The miocenic cliff at the NW edge of the Mesima sedimentary basin (Calabria, Southern Italy), Pages 143-145.